Good morning and a happy new month and first Monday of August to you all. I cannot believe, more than half of the year has gone, already. 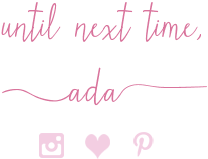 I have been so behind this entire Summer reading and commenting on the blogs I love and to tell you the truth, I am not slowing down in August but I will do my best this week and this month to catch up with some of you. 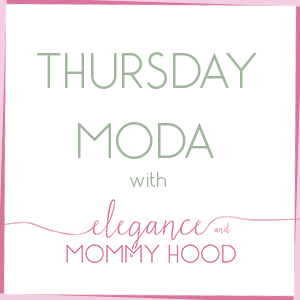 Thanks to those of you who stop by, read and comment my blog and linkup on Thursdays. Today I have a couple of Vacation Outfits to show you. This is the outfit I wore on the first evening we were in St. Joseph (July 3rd). The photos came out so bad, I apologize. I was messing with the camera but I don't know what I had pressed. The pictures were blurry and dark that evening, sorry. I selected the best of the bunch. 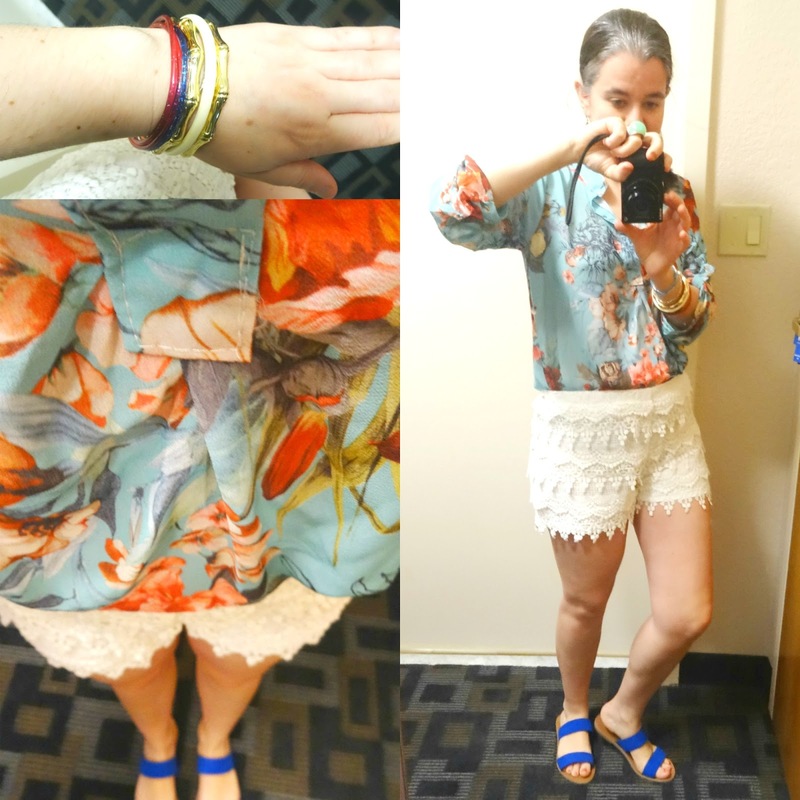 I paired some Off-White Lace Shorts with an Aqua Floral Print Popover Chiffon Blouse and wore my Cobalt Blue Merona Sandals which matched my Cobalt Tassel Earrings, a few Bangles and my Hot Pink Crossbody Hobo Bag. It was a little cool that evening. Viv is wearing the Cutest Baby Pink Collar Shirtdress in a Blue Umbrella Print. I ended up loving this outfit, a little dressy yet still casual and comfortable, definitely worth repeating it, no? 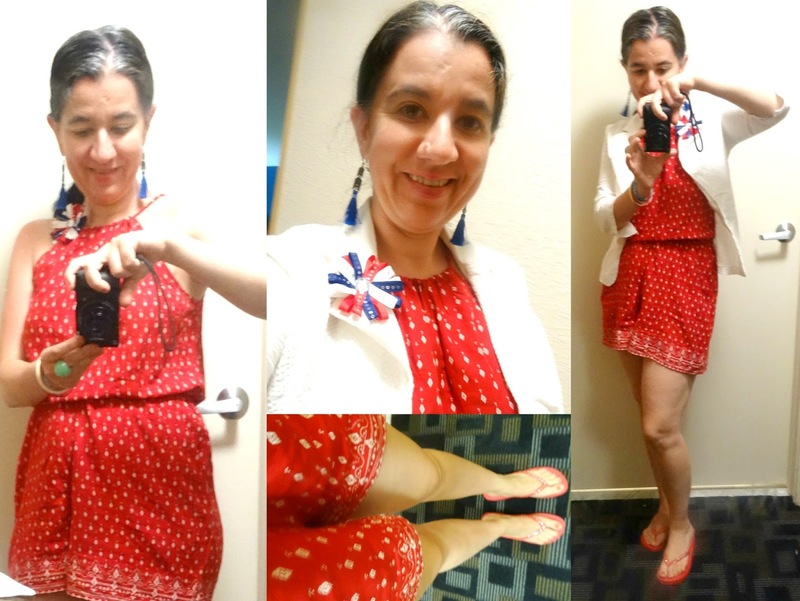 This is the Outfit I wore on the night of July 4th so I am wearing Red, White and Blue of course. I had on the same Cobalt Blue Sandals as in the first outfit but Viv grabbed this red pair of Wedge Flip-Flops (I had packed) for me because she said they matched my dress (actually a romper). The Red Romper has a small White Pattern on it and I carried this Crochet Cream Purse too. My pop of Blue comes via the Tassel Earrings and also the Flower Hair Clip (I wore as a brooch) which is in red, white and blue. For when it cooled off, I had on a very light and breezy Cropped, 3/4-Sleeve Swiss Dot White Blazer. 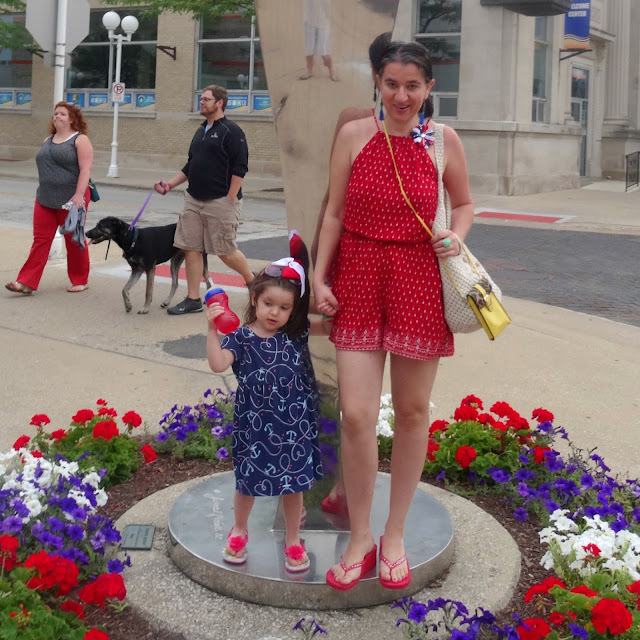 Earlier that day I had put Vivian in her American Flag Dress. 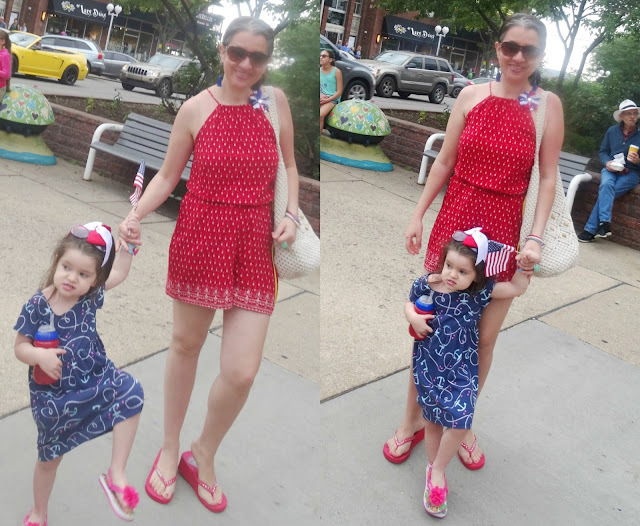 For the evening she wore a Navy Nautical Anchor-Print Dress with her Hot Pink Rosette Flip-Flop Sandals and a large Red+White Ribbon Bow on her hair. As you can see they had the cutest insects and animals down-town St. Joseph. Different artists had done them, every Summer they have a different theme, last year it was ducks. Vivian loved sitting on all of the animals and even kissed most of the frogs and turtles on their lips. She also stopped to smell the flowers because she loves flowers. She is the cutest! Aqua/Turquoise Floral Rose Print Chiffon Popover Blouse w/ Reversible Sleeves: c/o a Boutique in Albania (New) (similar, Steal, love this), (fun cropped option, Fantastic Deal, my Favorite), (gorgeous option, on Sale), (similar, Splurge). Off-White Lace Crocheted Shorts: c/o Pumps & Pushups (New) (similar, on Sale), (similar, love these), (similar, Splurge). Cobalt Blue Beaded Statement Earrings w/ Long Tassels: Old Navy (New) (similar, Steal, love these), (similar), (gorgeous dressy option. Splurge, my Favorite). 2 Twisted Gold-Tone Bangles: The Limited (New) (similar set, huge Steal), (similar, my Favorite), (similar, Splurge). Cobalt Blue Faux Suede Two-Strap Sandals: Merona via Target (New) (similar, Steal, love these), (similar dressy option, Great Deal). Baby Pink Collared Trapeze, Blue Umbrella-Print Shirtdress: Old Navy (New). Hot Pink, Long-Sleeve Tee: Wal Mart. Red, Halter-Style, Light Romper in a small White Pattern: H&M (New) (similar, Huge Steal, love this), (similar dressier option, Fantastic Deal, my Favorite), (similar, Great Deal), (similar). White, Cropped, 3/4-Sleeve Swiss Dot, Light Blazer: Forever 21 (similar, Steal, love this), (similar elegant option. Great Deal, my Favorite), (similar dressy option). Red+White+Blue Ribbon Sequined Flower Hair Clip (worn as brooch): Payless Shoe (New). Navy Anchor Dress w/ Peek-A-Boo Back: Wal Mart (New). Red+White Large Grossgrain Ribbon Bow: Wal Mart (New). Turquoise Wrap Bracelet w/ Pink Watermelons: Target (New).